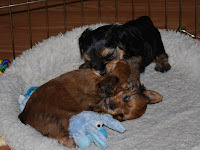 Shorkie Puppies - Playing with toys and each other! Reagan likes to hang out with the big boys! 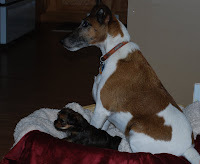 Puppies are getting so big it's hard for them to all find a spot to nurse off Mommy! Puppies trying to find a teat while Starr takes a potty break. They are doing great with paper potty training! Luckily these two decided to go for Puppy food when they couldn't get a teat! Here are some pictures of Reagan in the Santa dress, still a little big for her. She is the most vocal of the group and the first to eat puppy food. She dives in the bowl up to her elbows and was the first to get teeth! She loves to be held and wants to be out of the cage already so she can explore! Teeny Tiny Starr Christmas Shorkie Puppy! This is our tiniest little girl barely hitting 20 ounces at 4 weeks old. 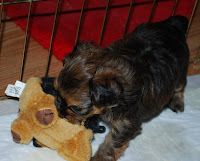 She such a sweet little girl and loves to snuggle and sleep with the other puppies. She reminds me so much of Ace from Daisy's litter last year. A total sweetheart! Her are some pictures I took of her in the Santa baby dress I found at the store today. It's an XXS and she is swimming in it! She won't be ready for adoption until just before Christmas due to her size. I know some lucky family is going to be so excited to see her under their tree! All six! Brooks, Montana, Starr, Dante, Tiki and Reagan!! They are really getting active now. Starting to lap up water and gum on puppy food as their teeth come in. They have also started to play/wrestle/lick each other. So fun to just sit and watch them! I need to get some video taken soon. They are starting to interact with each other now. Chewing and licking and a little wrestling. Soon we will see how they do with kibble. 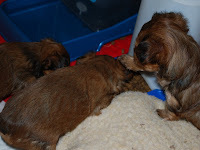 Three week old Shorkie Puppies! Mary sent me these cute pictures of Tori from Daisy's last litter. She is so cute and Mary says everyone just falls in love with her. I can totally see why! 2 weeks - eyes are open!